Take a virtual tour of one of the most desirable family communities in Valencia. The reason for this name is based on the fact that all of these homes are literally behind the popular Granary Square shopping Plaza on McBean Parkway. 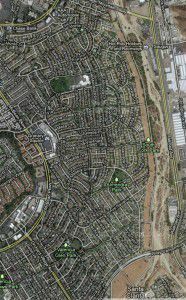 The interconnecting neighborhoods border Orchard Village Road to the south, Valencia Blvd to the north, McBean Parkway to the west, and Wiley Canyon to the east. Why is this area of Valencia so desirable for home buyers? So what is it that makes this area so desirable? As mentioned, a wide variety of homes are available to choose from in neighborhoods made for growing families. A paseo system connects each neighborhood to the next, as well as the walking and biking trails that interweave throughout the Santa Clarita Valley. Each community is also dotted with parks and swimming pools, and award winning elementary schools that are within a short walking distance from any home. The paseo system also will take pedestrians and bicyclists to the Westfield Valencia Town Center in minutes. Commuters will love the fact that the Interstate 5 freeway is also only minutes away, as is the Metrolink Train station and the Santa Clarita Transit hub. Take a tour on us! Would you like to take a tour of this neighborhood? What questions do you have about homes for sale in this or any other community in the Santa Clarita Valley?